Personally, I have been flying RC helicopters for over 1.5 years now, and sad to say, I was never really quite good at it. My initial and most important milestone goal was simply to hover my helicopter nose in, but achieving this goal was easier said than done. Even though I could already do it on a Reflex simulator, there was still a huge mental block doing it for real! Some might say that I might not have gotten some good heli’s which are stable enough to fly with, but come to think about it I do have the best heli’s already! My collection includes JR Vigor CS upgrade, X-Cell gasser with Zenoah 23.1 Engine and a fully upgraded T-Rex SE with micro heli frame etc. Needless to say, I am not really short of good heli’s to begin with, but just like anything else, when flying these heli’s I somehow get the feeling that these particular heli is either too advance or too agile or not quite 100% right to the way I would like my heli to respond to my control inputs. To put things into proper prospective, let me begin with my T-Rex. I have spent so much money on this little machine that it literally has already surpassed the amount I spent on my large X-Cell Gasser. However, even though it is a joy to fly and very stable since all are metal parts already, I have found it to be too agile for my taste and my skill level. When doing the figure 8, I find it flying too fast to the point that I feel nervous whenever it passes by me close. The biggest gripe I have about my T-Rex is the way it accelerates too quickly once a direction is given, picking up momentum too fast thus causing nervousness on my part. What I mean is that when I give it a forward or side input or any flight direction, it immediately accelerates to a certain speed that I am not quite comfortable flying and controlling, causing me to pull back on the elevator or any opposite direction thus slowing down the heli and losing momentum. For this reason, I have always hesitated in doing any nose in hovering with this heli for the simple fear that it might quickly end up in front of my nose for real. The X-Cell gasser is a great machine but maintaining a stable hover was more difficult due to slower rotor speed. Now as for JR Vigor, the main reason for my own insecurities and mental block was due to the powerful engine noise and vibration that it generates thus causing me to lose concentration on the nose in hovering process. Some people might say, why not hover it farther away from me, but that is exactly the point! Trying to learn nose in hovering with my heli that is too far away causes me to miss the fine details of each corrections needed to keep the heli alight and stable because it is too far away to see right away. Now, the EP-8 on the other hand was really a breath of fresh air due to the following reasons. The size itself was just right, not too small to be affected by changes in wind directions and not too big to be intimidating when it gets too close while hovering. At 11.1 Volts 3S1P, with 22T pinion which allows the rotor speed to turn at about 1600 to 1800 head speed which provides a relaxing hover. It is quiet enough that it can be flown at midnight in a park without disturbing the neighbors. 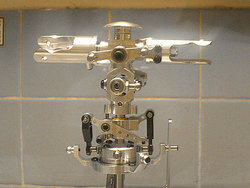 All the parts are all metal and precise to the touch of one’s control input without slop. These are the reasons why I call it a breath of fresh air. My initial flight on the EP-8 was of course not quite perfect just like anything else. The heli itself was well put together and all, but of course the adjustments on the Dual Rates and Exponentials on the transmitter still needed to take place. After about 5 flights, I finally fine tuned it to my liking. A few features about the EP-8 that I like are that it’s versatile and flexible to accommodate my needs such as: It is just the right size the right size for indoor and outdoor flying. I can fly it inside my living room, bedroom or right out in the garden and/or all the way to the flying field without being out of place. It is so stable to fly a beginner can feel confident faster even only after 10 flights as attested by my beginner heli flying friend Benjamin Jalandoni who was able to do mini-figure 8 fly-outs already by the time he achieved over 15 flights under his belt. Since the heli is electric it does not leave any residue or a sticky oily substance that needs cleaning, all one has to do is just give it a quick basic wipe-down after every flight and it stays as good as new. 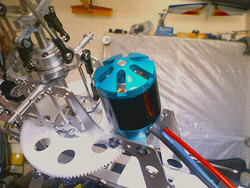 The vibration caused by the motor is minimal; therefore the heli stays well intact and is less likely to have bolts, nuts and screws coming loose during flight. My experience flying this machine has been nothing but positive to say the least. Right from takeoff, even though this heli is configured slightly nose heavy due to the 4100mha lipoly battery, it hovers nicely without problems. It has a small forward drift due to the nose-heavy setup but easily correctable with the pull on the elevator stick. I often hover this tail in just a little over 1 meter away from me without fear of losing control. As we all know, when a person flying an RC Heli is doing the figure 8 basic fly-out maneuver, there are 2 specific points during the turn-in where the heli faces the flyer on a 45 degree angle and flies pass the him/her either from the left side to the right side or from the right side to the left side on a forward momentum. How I achieved nose in hovering was based on choosing my angle of attack from the a 45 degree left angle fly in and slowing the heli down when it reaches directly in front of me but about 10 meters away about 1.5 meters high, slowly turning the nose in to eventually facing me directly and slowing the heli down to a standstill. By the time the heli is on nose-in hovering position in front of me, it is only 5 meters away and drifting slowly to the right. I try to keep the heli on the same spot for as long as I can and of course the goal is to maintain it for 30 seconds or more, but this is when I get nervous and begin to lose control. The EP-8 beginner’s setup which encompasses a 3S1P Li-Poly battery with a 22T pinion allows beginner lots of room to make mistakes and still be very forgiving. What I am trying to say is that the EP-8 reacts to the flyer’s immediate input but does not over-react to the nervous twitches thus maintaining a calm and stable flight allowing the flyer the precious time needed to correct their mistakes before disaster occurs. This particular factor is very important for a beginner or someone trying to develop a new skill because in the process of trying to develop a new skill, uncertainty and nervousness sets-in thus causing jerky and unintended movements leading to mistakes etc. The most important factor of flying a heli is similar to riding a bicycle. Achieving the distinction of “BALANCE” is the key. Hovering an RC heli is just like riding a bicycle where it is all about having a strong distinction for balance and maintaining it over a period of time. The EP-8, makes this easy. The EP-8 in my opinion is the best little electric heli a beginner to intermediate flyer and for advance flyers as well provided appropriate upgrades are added. 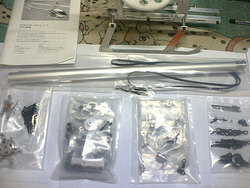 The parts are already all metal therefore no upgrades are necessary for beginners and intermediates, but for advance flyers, one might need to make minimal upgrades on batteries, speed control and the electric motor only. Finally, being co-owner of Hobbies Unlimited we often come across people who want more power for their heli etc. Lots of people want to talk about 3D, power, speed and more power for their heli, but few talk about developing skills. Therefore if I can make a simple comment about this I will sum it up in just a few words. It looks really cool in the video. The guy said that this model is good for beginners too, so that's a real plus. However, I've never seen this model in any shops, is it not popular? It looks really nice in yellow, I like it. 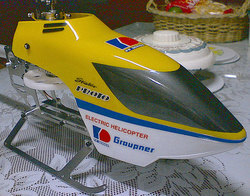 I am looking for these kind of helicopters, so would you tell me how can I buy this helicopter? Or would you also sell this? Considering that this video was uploaded on 16 Aug 2006 (i.e. Almost 6 years back.) It should be either available with spares or out of production by now. I can't help wondering why this review on an old heli has appeared here!! !